They say that artificial intelligence is only artificial intelligence until you start using it; then it’s software. With that in mind, the Summit on Legal Innovation and Disruption (SOLID) which took place in New York on September 13, 2018, looked at the future of legal services from a practical perspective. At this conference, the vendors who are creating technology for legal service solutions talked to their clients face-to-face. And the in-house counsel and other lawyers using these solutions gave real answers on what they are looking for from their technology. The conference had a fast pace and an intimate feel. One attendee said, “If most conferences are blog posts, SOLID is Twitter.” The presenters gave short, Ted Talk styled speeches, and spoke with interested parties afterwards. They discussed the philosophy of innovation, citing the value of “failing fast” and the importance of an organizational culture which permits experimentation to find better ways to work. From machine learning and artificial intelligence to solutions for in-house counsel looking for outsourcing networks, people ahead of the curve in new legal solutions were there. 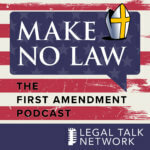 And so was Legal Talk Network!